(Nanowerk News) Moving holograms like those used in 3D science fiction movies such as Avatar and Elysium have to date only been seen in their full glory by viewers wearing special glasses. Now researchers at Swinburne University of Technology have shown the capacity of a technique using graphene oxide and complex laser physics to create a pop-up floating display without the need for 3D glasses. Graphene is a two dimensional carbon material with extraordinary electronic and optical properties that offers a new material platform for next-generation nanophototonic devices. Through a photonic process without involving heat or a change in temperature, the researchers were able to create nanoscale pixels of refractive index – the measure of the bending of light as it passes through a medium – of reduced graphene oxide. 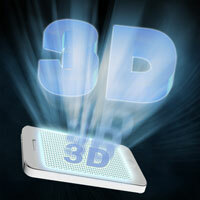 This is crucial for the subsequent recording of the individual pixels for holograms and hence naked eye 3D viewing. “If you can change the refractive index you can create lots of optical effects,” Director of Swinburne’s Centre for Micro-Photonics, Professor Min Gu, said. Dr Xiangping Li, who is one of the leaders of this research, said: “Owing to its atomic layer thickness and high mechanical strength, the use of graphene in mobile display units for flat two-dimensional displays is burgeoning. Professor Gu said this new generation digital holographic 3D display technology also has applications for military devices, entertainment, remote education and medical diagnosis. The research is published in Nature Communications today ("Athermally photoreduced graphene oxides for holographic 3D images"). It is a collaboration between Swinburne University of Technology, the Beijing Institute of Technology, Griffith University and Tsinghua University in China.